Spanish helmet closed by the turn of the sixteenth century heyday of the Iberian kingdom that is reflected in the subsequent manufacture of weapons and armor. 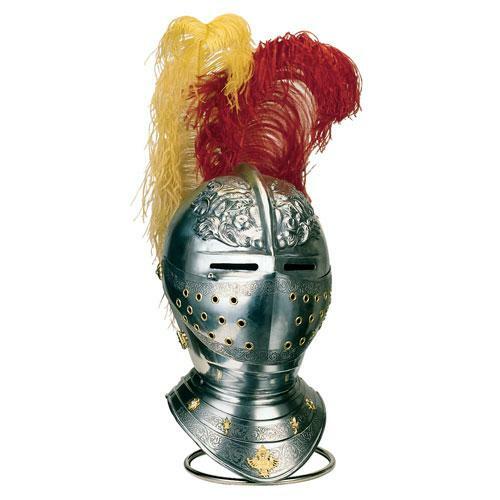 This Spanish Horse Helmet of the 16th century by Marto of Toledo Spain is a replica reproduction of helmets used by mounted knights during the reign of Charles V and Philip II, today part of the collection of the Real Armeria (Royal Armory) in Madrid. This Spanish Horse Helmet is made of steel and characterized by eyeslits that are carved out from the front part of the skullcap, because the little visor covers only the central sector of the face. Enriched by etchings on the visor and the gorget and by an elaborate figure in bas relief on the skull cap. Provided with two colored ostrich plumes and a display stand made in steel.